A Bangor resident registers her company truck at Bureau of Motor Vehicles Bangor branch. The Maine secretary of state's office will now allow people who don't identify as either male or female to choose a non-binary gender designation for their license or ID. 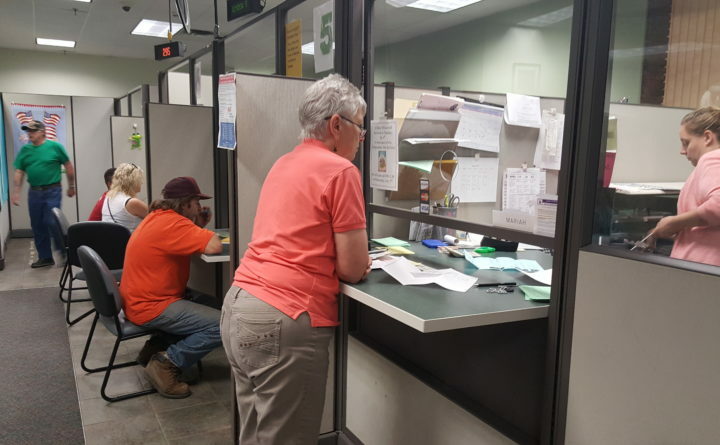 The Maine Bureau of Motor Vehicles will now allow residents to designate their gender as “non-binary” on driver’s licenses, to the Maine secretary of state’s office. The change makes Maine the first New England state and third U.S. government entity to offer the option, according to Equality Maine. Oregon and Washington, D.C., already offer a non-binary gender option, and California will follow suit in January 2019. Starting Monday, Maine residents who want to change the gender on their licenses from “male” or “female” to “gender non-binary” can apply at any BMV branch office for a sticker to be placed on their license or ID that reads “Gender has been changed to X – non-binary,” said Kristen Muszynski, a spokeswoman for Secretary of State Matthew Dunlap. The sticker is also available for identification cards. The BMV will not start printing new licenses and ID cards until July 2019, when the BMV is already set to roll out a new design for state licenses and upgrade its systems, Muszynski said. The third gender option provides an alternative to people who do not identify as male or female, which had been the only two options for Maine licenses until now. That restriction became the basis of a Maine Human Rights Commission complaint last year, filed by a South Portland resident who was denied a request for a license with a gender designation other than male or female, according to Equality Maine, whose attorney represented them in an ensuing period of litigation. The legal proceeding set in motion the change announced Monday. “We know gender is a spectrum and some people don’t identify as male or female. It’s important that driver’s licenses and other forms of IDs recognize people who are non-binary. Removing barriers for people is critical to helping all of us live healthy, productive lives,” said Zack Paakkonen, the Equality Maine attorney who represented South Portland resident Ian-Meredythe Dehne Lindsey. “Words cannot adequately express the relief I feel, and how happy I am, that my ID will now reflect such an integral part of my identity and who I am,” Dehne Lindsey said. The change request forms are available online, and can be submitted to any BMV branch. The sticker is free.